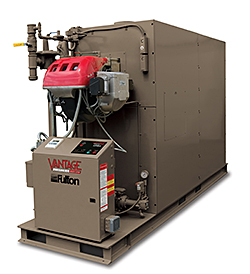 The B100 biodiesel Vantage boiler can use B100 biodiesel and ultra-low sulfur (under 15 ppm) heating oils for full condensing operation. Available up to 4 million BTU/hr. Capable of configurations for liquid fuel, natural gas, or dual fuel operation. Can be fired short-term with conventional #2 heating oil in non-condensing mode.